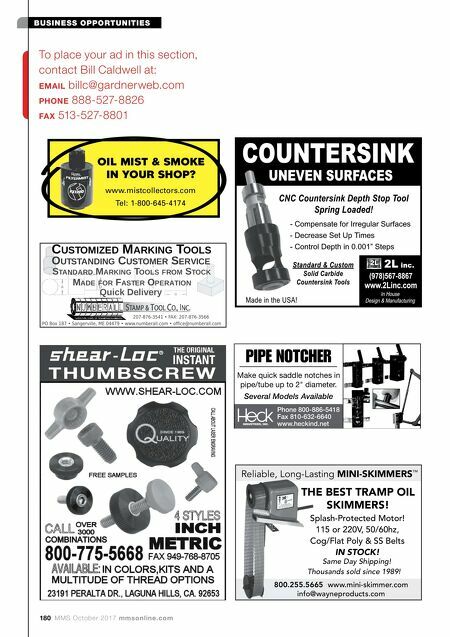 180 MMS October 2017 mmsonline.com BUSINESS OPPORTUNITIES To place your ad in this section, contact Bill Caldwell at: email billc@gardnerweb.com phone 888-527-8826 fa x 513-527-8801 OIL MIST & SMOKE IN YOUR SHOP? www.mistcollectors.com Tel: 1-800-645-4174 Quick Delivery STANDARD MARKING TOOLS FROM STOCK OUTSTANDING CUSTOMER SERVICE CUSTOMIZED MARKING TOOLS MADE FOR FASTER OPERATION Phone 800-886-5418 Fax 810-632-6640 www.heckind.net PIPE NOTCHER Make quick saddle notches in pipe/tube up to 2" diameter. Several Models Available THE BEST TRAMP OIL SKIMMERS! 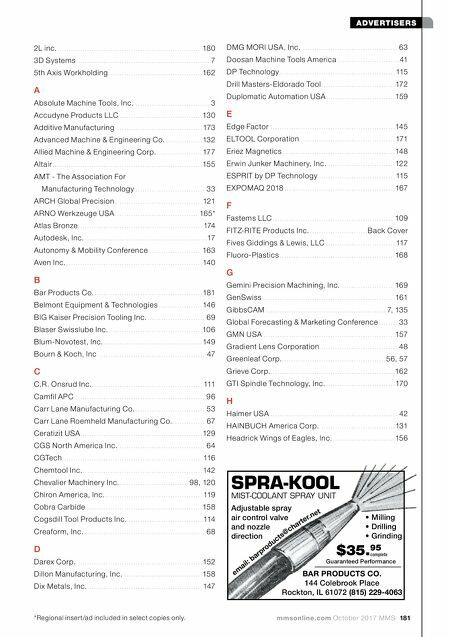 Reliable, Long-Lasting MINI-SKIMMERS ™ 800.255.5665 www.mini-skimmer.com info@wayneproducts.com Thousands sold since 1989! Splash-Protected Motor! 115 or 220V, 50/60hz, Cog/Flat Poly & SS Belts IN STOCK! Same Day Shipping!